For more than a decade, Eggland’s Best has been recognized by Chefs in America with “The American Masters of Taste” Gold Medal Seal for having superior taste, freshness, and appearance. Chefs in America draws from a nationwide network of professional chefs to conduct year-round triple-blind taste tests on a myriad of foodservice and retail grocery products. 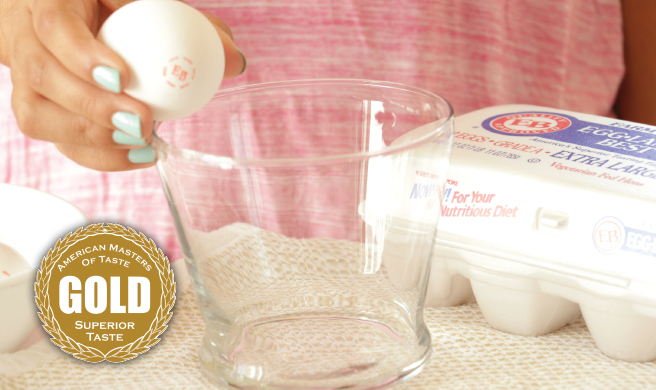 This prestigious award spans the Eggland’s Best portfolio, honoring EB Classic Eggs, Organic Eggs, Cage-Free Eggs, and Hard-Cooked Eggs. Each product was blindly judged and named superior compared to other products within its category. Compared to ordinary eggs, EB eggs contain 6x more vitamin D, 25% less saturated fat, more than double the Omega-3s, 10x more vitamin E and more than double the vitamin B12. EB eggs are also an excellent source of vitamin B2 (riboflavin) and vitamin B5. Our superior nutritional profile is due to the proprietary all-vegetarian hen feed that contains healthy grains, canola oil and a wholesome supplement of rice bran, alfalfa, sea kelp, and Vitamin E. To find out more, click here.